The topic for our July Wine Pairing Weekend, aka #winePW, cleverly takes advantage of both American and French celebrations during the month. Michelle Williams, of Rockin Red Blog, posed the challenge to us of pairing food and wine from either or both America and France in honor of July 4th, our Independence Day, and July 14, Bastille Day. We had a great time with the pairing this month. We decided on the wine first, this time. The decision was an easy one for us, as we had recently received two wines as tasting samples courtesy of Creative Palate Communications that just happen to be French. They are 2014 Les Vignes de Bila-Haut Blanc and Les Vignes de Bila-Haut Rosé both produced by Michel Chapoutier. We thought it would be fun to pair an American dish with our French wines. Given that we were pairing a rosé and white wine, and that the weather had been particularly toasty, we wanted something easy and light that was also delicious. I’m not sure we entirely succeeded on the easy and light part of our challenge, but it certainly was delicious! 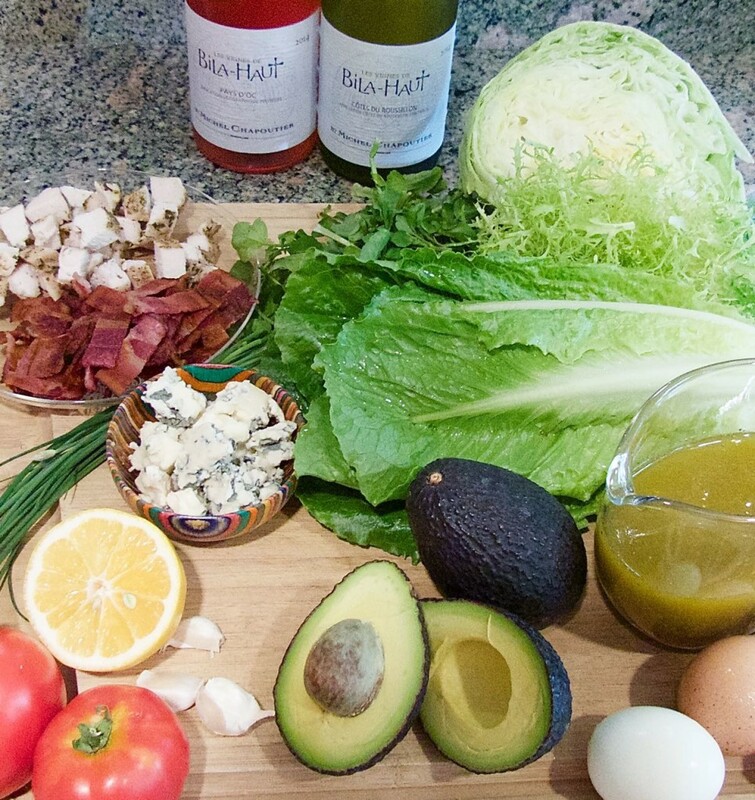 To accompany the 2014 Les Vignes de Bila-Haut Blanc and Rosé we prepared Cobb Salad. I was fairly certain that the Cobb Salad is an American “invention”, and a quick online search verified that it is. The salad was the creation of Robert (Bob) H. Cobb, manager and eventual owner of the Brown Derby restaurants. The first Los Angeles restaurant opened in 1926 on Wilshire Blvd. It’s the one shaped like a hat. The second location, in Hollywood, opened in 1929 near the corner of Hollywood and Vine and the Beverly Hills restaurant opened in 1931. The last restaurant opened in Los Feliz in 1941. 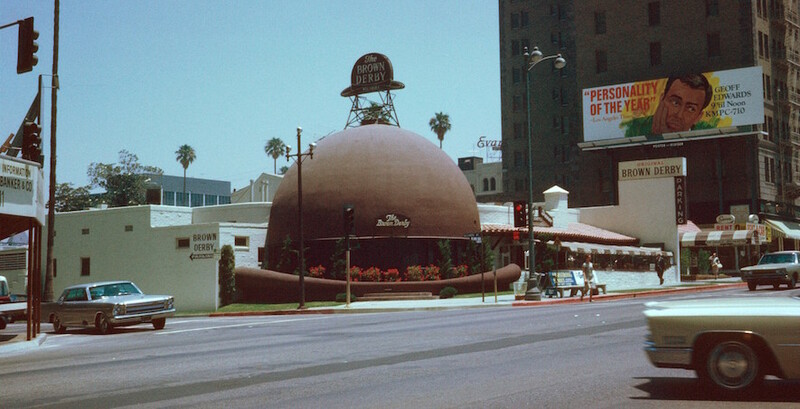 The original Brown Derby restaurant. I read several explanations as to why the restaurant was so named and why the original was built in the shape of a derby. It had to do with either the fashion of the day for a gentleman’s hat, or a comment made by Wilson Mizner to co-owner Herb Somborn. Either way, the restaurants became famous and were frequented by Hollywood actors, producers and directors. Bob Cobb was hired by the original owners (writer Wilson Mizner, movie producer Herb Somborn and theater owner Sid Grauman) to manage the restaurants. It was late one evening that Bob threw together a quick dinner for himself. He combined chopped lettuce, chopped chicken, bacon, hard-boiled egg, chives, avocado, cheese and French dressing. The story continues that Sid Grauman, who was there at the time, asked for a taste and liked it so much he ordered “Cobb Salad” on a subsequent visit to the restaurant. Cobb Salad eventually became an item on the menu. Mr. Cobb became owner of the restaurants after Herb Somborn’s death and managed the restaurants until his death in 1970. I found and prepared the original Cobb Salad recipe. Though the ingredients are simple, they are numerous and involve lots of chopping. The recipe calls for four kinds of lettuce alone: romaine, iceberg, watercress and frisée (called chickory in one recipe). 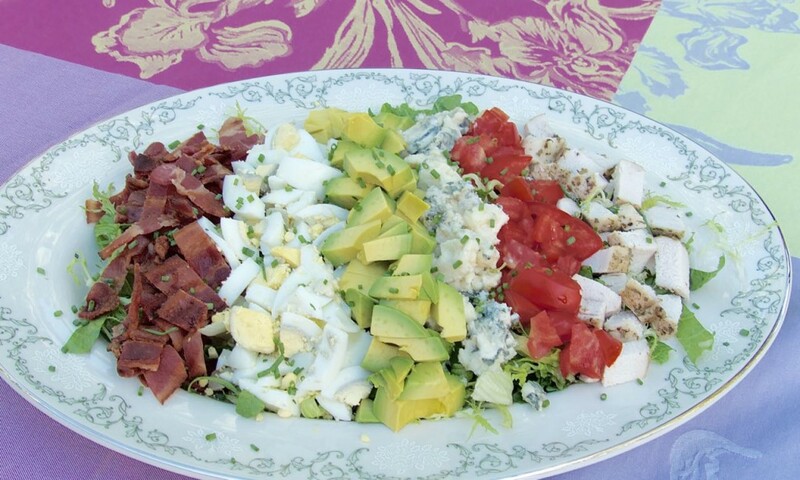 Additional ingredients that also required chopping: chives, tomatoes, chicken breasts, bacon, Roquefort cheese, hard-boiled eggs and avocados. I also made the French dressing following the original recipe which contains red wine vinegar, sugar, lemon juice, salt & pepper, Worcestershire sauce, Dijon mustard, garlic and olive oil. Water is optional, which I omitted. Whew! With everything neatly chopped and the French dressing mixed I placed the chopped lettuces on a platter. Then I added each chopped item one next to the other over the bed of lettuce. I have to say, it was a lot of work, but looked very pretty. After admiring our creation, and taking pictures of course, I mixed half of the lettuce and chopped toppings with a bit of the French dressing and we dug in. The mixture of lettuces provided great textural contrast and the watercress a peppery flavor. The process of tossing the salad ingredients with the dressing caused the cheese, avocado and chopped hard-boiled eggs to mix with the dressing to make it almost creamy. Every bite tasted different. The crumbled Roquefort cheese provided a creamy, pungent, salty flavor. The bacon was smoky and salty (I used Niman Ranch Applewood Smoked Uncured Bacon. It is delicious and worth the extra cost.) I seasoned the chicken breasts liberally with salt & pepper and Terragon before oven roasting them. That pop of Terragon was the perfect addition. We were fortunate to find perfectly ripe avocados which were so flavorful and firm yet creamy in texture. The tomatoes came from our garden and were juicy and flavorful. Even the the little bursts of chive flavor didn’t get lost among all of the other flavors. Michel Chapoutier is a name any lover of Rhône wine will recognize. Maison M. Chapoutier is a family-owned winery located in Tain-l’Hermitage in the northern Rhône. The family’s winemaking history there dates back to 1808 and is closely linked with Hermitage. Though the family’s winemaking roots are in the northern Rhône, current winemaking interests also include vineyards in Alsace, Portugal, Australia and the Languedoc-Roussillon region in southern France. Domaine de Bila-Haut is a 190-acre property in the Agly Valley near Latour-de-France in the Roussillon wine region not far from the border with Spain. The vineyards are planted to Syrah, Grenache and Carignan in varied soil types. This region of France is very warm during summer with little rain during the growing season. We previously sampled a wine produced from these Domaine de Bila-Haut vineyards, and it was truly a special wine. The two wines we enjoyed for this pairing are wines made by Michel Chapoutier for everyday drinking. One is produced under the Côtes du Roussillon designation, the other is Pays d’Oc IGP classified. We found both of these wines offered excellent quality for the price. 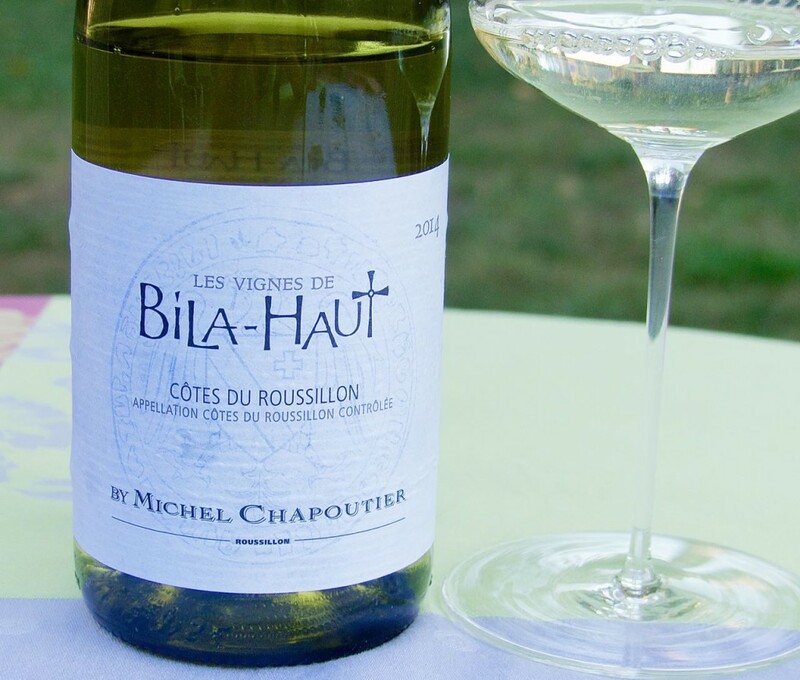 2014 Les Vignes de Bila Haut Blanc Côtes du Roussillon — pale yellow in the glass with tart pineapple and melon aromas. On the palate minerals, citrus zest and delicate melon flavors combine with bright acidity and citrus pith on the finish. 13% ABV. This white wine is a blend of Grenache Blanc, Grenache Gris, Vermentino (also known as Rolle) and Macabeo. These varieties play well together to produce a flavorful, bright and crisp wine. Roussillon produces dry still wines and Vins Doux Naturels (fortified sweet wines). With 14 AOP certified wines, stemming from 23 different grape varieties, and with its characteristic patchwork of terrains, Roussillon offers a diverse range of wines with distinctive qualities. 2014 Les Vignes de Bila-Haut Pays d’Oc Rosé — rosy pink in the glass with strawberry and citrus aromas. On the palate strawberry and ripe blackberry flavors combine with dusty earth and a squeeze of citrus for a clean finish. 13% ABV. The growing region included in the Pays d’Oc IGP classification is large, beginning at the Spanish border and continuing along the Mediterranean to the Rhône River delta. As you might expect, this very large growing region means varied soil types and climates. 56 grape varieties may be used in the production of Pays d’Oc IGP wines, giving winemakers lots of choices in the production of unique wines. With so many flavors combined in the Cobb Salad I wondered if the wines might not be overshadowed by the combination. That turned out not to be the case. Both of these wines held up nicely and complimented the salad. The flavors of the salad came through nicely without changing with either wine. 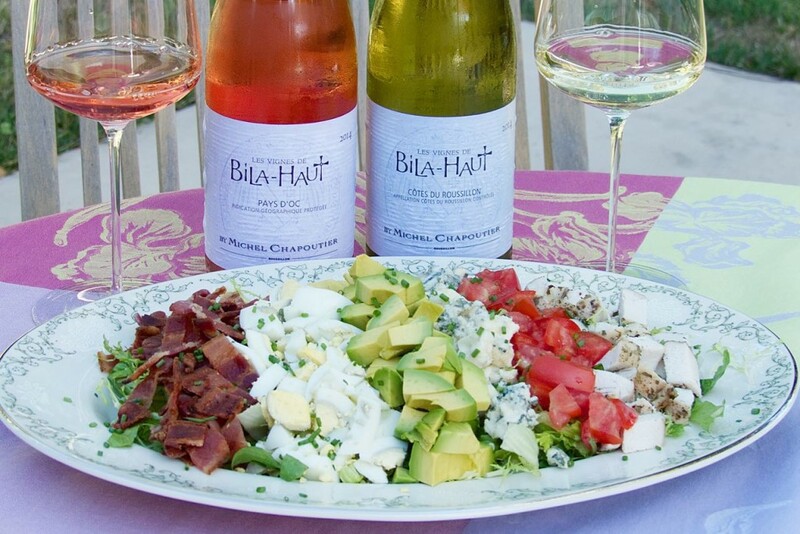 We found the flavors and bright acidity of the Les Vignes de Bila Haut Blanc Côtes du Roussillon supported the flavors of the Cobb Salad without trampling the flavors of the salad, but didn’t disappear itself. Because it was such a good partner for the Cobb Salad, we awarded the Les Vignes de Bila Haut Blanc the Best Actress in a Supporting Role award for the evening. The combination of flavors in the Cobb Salad really brought out the berry flavors of the Les Vignes de Bila-Haut Pays d’Oc Rosé. The combination was very surprising, and delicious. The Rosé won our award for Best Actress in a Leading Role. Pete’s comment as we finished dinner completely summed up how well we liked both Bila-Haut wines, “It is so nice to have two sample wines that it is a pleasure to finish.” So true. Over the next several evenings we finished them both and they held up very well, tasting just as delicious on the third evening as they did on the first. Thanks to Creative Palate Communications for sending these delicious wines our way. They certainly are food-friendly wines, just as winemaker Michel Chapoutier intends. Whenever I see Cobb Salad on a restaurant menu from now on I will always think of 1930s Hollywood and hard-working restaurant manager Bob Cobb. You can read about the other wine and food pairings the rest of our #winePW group prepared on their blog posts listed below. And, thanks Michelle for the fun challenge! We will all be chatting about our food and wine pairings Saturday morning at 8am PST on Twitter. Follow #winePW to join the conversation. Also, join us Saturday, August 15 as we explore Portugal, a land of delicious food and outstanding wines! A Sampling of Okanagan Valley Wines -- Just In Time For Summer. I think I need a Cobb Salad. Beautiful presentation. My prep stage never looks that pretty! Thanks Jade! The pairing was really delicious. Cheers! awh, and here I thought Cobb salad was named in honor of Ty Cobb. (no historical backing to it, I just liked thinking that) The Brown Derby is definitely an amazing place with such fantastic history. I have to say it again, your pictures are so amazing- so crisp and clear. Makes me feel like I can just reach right out and take a forkful! Spoken like a true baseball fan! Thanks for your kind words, Lori! Your post reminds me it’s been too long since I’ve had a Cobb salad Nancy! I love that you tried both wines and differentiated how they paired with the wine. I can totally see the Rose getting the Best Actress in a Lead Role! Wonderful read! Thanks Martin. The salad really was delicious — the perfect combination of ingredients + very nice wines. Cheers! Such a beautiful salad, and I love that you mixed French and American for your pairing! Great choices! Thanks Sarah. It was a fun theme! Love Cobb salads! Definitely my favorite and nice pairing with the French wines. Made me want to make one this week. Want to try this dressing too! Thanks Jennifer. We had lots of fun with this preparation. Cheers! 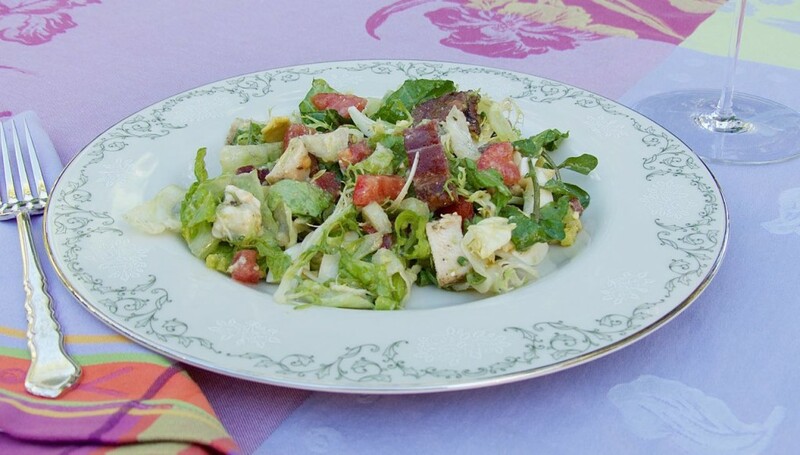 I never knew Cobb salad was an American invention, so much for the thought of it being a traditional Provencal dish! We always learn so much in preparation for #winePW. It’s always lots of fun. Cheers Jeff! How funny, you chose an American salad with a rose and white wine, and I chose a French salad with rose and white. Your salad is one of my favorites. I love a Cobb salad the combination of flavors and textures is delicious. I also like the rose best with my salad. Beautiful post. Yes, great minds think alike! I do love salads in the summer particularly and this one was really delicious. The combination of ingredients was just perfect. Thanks Suzanne. Cheers! Great pairing! Just how summer wine and food pairings should be. Really enjoyed the history of the Cobb Salad too! Thanks Christy. We had lots of fun with this theme and the pairing…even if it was a lot of work chopping ingredients. Cheers! Thank you Michelle, and thanks for the inspiration. Cheers! The French have Nicoise Salad and we have Cobb Salad, either is perfect for a hot summer day in July with a nice crisp wine. I will have to keep an eye out for the Bila Haut label.